Woo hoo, I have a finished bag. The Open Wide Bag, I was making my sister is completed. This was the first time I had used soft and stable, I really like how the bag holds it's shape. I made the large bag which is approximately 9" x 12" x 6", and omitted the front contrasting fabric panel, because I didn't want to lose any of that beautiful Kaffe print. I may make another one in the medium size for me, and would increase the binding width to 2.25" for the binding around the zipper, which I think would fit slightly better. Overall, I am really pleased with how it has turned out. I had forgotten how much I enjoyed making bags (even if they do cause a little bit of bad language to be muttered). I think my sister was planning to use it for crochet projects, and it looks as though it will hold quite a lot. Now to package it up and post it off to Australia with some treats for her. Now, it's YOUR turn to share, by linking up your sewing and stitching projects, following these guidelines. Somewhere in your post, please link to this post. 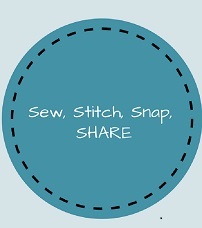 Please comment on a couple of the other Sew,Stitch, Snap, Share links - it's fun to receive comments from new people, and we are trying to encourage people to read blogs and keep blogging too. Fabulous finish! I don't blame you for not wanting to cover up the pretty fabric with a pocket. Well done you. Gorgeous bag Julie! That Kaffe print is an absolute winner isn't it? I love the simple and graphic flowers in such a lovely colour palette ! I am sure your sister will love it! Woo Hoo! it's finished! Looks wonderful, Julie. Can I be your sister too??!! It looks lovely! Your sister will love it! Woo hoo, your bag is beautiful!!! That Kaffe print is beautiful, some of my favorite colors, turquoise, lime..
Congratulations, your sister will enjoy using it. A lovely bag! I've never made one, I think putting in the zip would give me trouble! Your sister will be happy with her new bag! Smart idea not to cut up that beautiful Kaffe print! Every once in a while, it's nice to step aside from those slow moving, long term quilting projects and just make something with a faster end result. I have a package of soft and stable, but can't seem to put my quilting projects aside long enough to use it. Hmm... maybe when it's close to Christmas and I need a few presents. Very pretty bag... looks like a nice size too. Lovely finish Julie, your sister's going to be very happy! Beautiful bag, your sister will be very happy with it. Ohh I love this bag. Like you I enjoy making bags despite the odd frustration they can cause.